Ever fancied putting together and gigging with your own band, composing your own piece of music and seeing it performed live, devising and directing your own piece of theatre or performing a piece of physical theatre within a multimedia performance? We offer a range of courses within the performing arts curriculum area where you could find yourself doing this and more: a BTEC level 3 National Extended Certificate in Music; A level Music, Drama and Theatre Studies and Dance. We are lucky enough to be able to provide you with a learning environment that will enable you to achieve professional results within your chosen field, from the double height drama studios with full lighting and sound rig to the professional standard recording studio. Dance at A-level requires both excellent technical and expressive skills in performance, and the ability to write analytically and critically about set works of modern dance such as those of the Rambert Dance Company and other smaller companies at work in Britain today. The performance element includes a compulsory solo drawn from the modern repertoire, work as a quartet, and a piece of group choreography written by each student and performed by the ensemble. The written examination focuses on the critical analysis of at least two set works from the late 20th and early 21st century. Drama and Theatre Studies A-level students study a range of texts in performance. They develop and perform interpretations of material as a group, and in individual monologue or duologue. This emphasis on performance develops creative and communicational skills to a high degree. There is also a substantial written paper which asks students to write a number of analytical essays. These draw on preparatory work on reviewing live performance, on the detailed study of a performance text, and on a precise understanding of drama theorists such as Brecht and Artaud. Music A-level requires performance to a high standard, both solo and in ensemble, on at least one instrument. Students also study composition, learning about the principles of melody, rhythm, harmony and developing orchestration skills using industry standard notation software. Finally, students study works from a set anthology and develop their listening and appraisal skills across a range of genres: music for film, vocal and instrumental classical music, jazz, fusion, pop and so on. You need to be passionate about music, but also very articulate and analytic. This subject is assessed through written exam papers and also performance. Music Technology A-level is delivered by teachers with years of experience in the music industry including performance, recording and production as well as work for film, theatre and television. State of the art facilities will be available to you including MacBooks, Logic Pro software, and a fully equipped recording facility with live room and vocal booths. A sound understanding of music is essential to enrolling on the A-level Music technology course and keyboard skills are an advantage, although you do not need to have graded exams on an Instrument as we will audition you to assess your standard. We prefer you to have achieved a level 6 (grade B) in GCSE Music or a Merit in Level 2 BTEC, although we will consider those will musical skills and knowledge of music software. In sum, whichever of our subjects you choose, as a Performing Arts student you will have the opportunity to work with a range of passionate teaching staff, always looking to tap into what’s new and contemporary in the performing arts. You will be able to learn and develop in a practical sense through a range of workshops with professional companies and practitioners, and through a variety of external trips and performances to give you a true sense of the industry and deeper understanding of your chosen field. 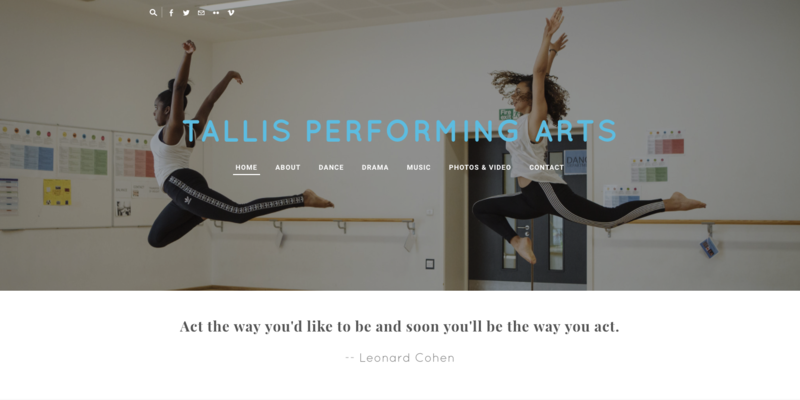 Ex-Tallis students are in the West End, in Hollywood and at the best universities in Britain.